US police on Wednesday charged Empire actor with lying to authorities about being the victim of a racist and homophobic attack on the streets of Chicago. Jussie Smollett, who stars in the Fox network drama “Empire,” is facing felony criminal charges of disorderly conduct and filing a false police report. He claimed that on January. 29th two masked men beat him late at night in downtown Chicago while yelling racist and homophobic slurs. The alleged incident initially seemed to serve as an example of growing intolerance in the US and led to an outpouring of support for the actor. But over the following weeks, the 36-year-old went from victim to suspect. “Felony criminal charges have been approved by Cook County State’s Attorney’s Office against Jussie Smollett for Disorderly Conduct / Filing a False Police Report,” Chicago police spokesman Anthony Guglielmi said in a statement late Wednesday. “Like any other citizen, Mr. Smollett enjoys the presumption of innocence, particularly when there has been an investigation like this one where information, both true and false, has been repeatedly leaked,” attorneys Todd Pugh and Victor Henderson said in a statement. The actor reported to police that his alleged assailants poured bleach on him, tied a rope around his neck, and yelled “This is MAGA country” – a reference to US President Donald Trump’s “Make America Great Again” slogan. But detectives grew suspicious of the account after interrogating two men who reportedly revealed that they were hired to stage the incident. 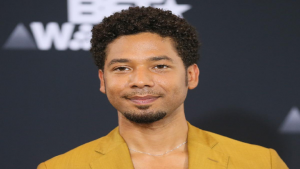 Chicago TV station WBBM said the men, brothers Ola and Abel Osundairo, claimed Smollett was unhappy that a threatening letter he had earlier received at the Chicago studios where “Empire” is filmed had not received enough attention. Gloria Schmidt, the brothers’ attorney, told reporters Wednesday that the men testified under oath about what they knew without a plea agreement and did not expect to be charged with a crime. “They’re not guilty of anything,” Schmidt said. “I think Jussie Smollett should come clear, because the truth will set him free,” she said. The initial news of Smollett’s claims led to widespread condemnation and shock. An outpouring of support came from public figures such as Emma Watson, Katy Perry, and Joe Biden. But Smollett’s story appeared to unravel with a steady stream of leaks to US media, and has since become a cautionary tale in an era where incomplete information is quickly spread via social media. “Many politicians and journalists seemed to suspend all critical thought in a campaign to indict not just Mr. Smollett’s attackers but the country as a whole,” opinion writer Noah Rothman wrote in The New York Times. A 2018 analysis published by The Center for Public Integrity found more than 2.4-million crimes between 2012 and 2016 in which hate was suspected to be a motivating factor. FBI statistics show hate crimes rose 17% in the US in 2017, especially against African-American and Jewish populations. “The real tragedy in all of this is that hate crimes are, in fact, on the rise in the Trump era,” Rothman said. Senator Harris was among those struggling to reconcile her initial statements with how the case has unfolded, when asked on Monday by a reporter about what she now thought of Smollett’s claims. “It’s something we should all take seriously whenever anyone alleges that kind of behaviour, but there should be an investigation,” Harris said, according to Fox News. The post Chicago police charge Empire actor with filing false report of assault appeared first on SABC News – Breaking news, special reports, world, business, sport coverage of all South African current events. Africa's news leader..